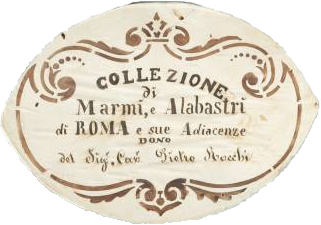 The collection, which comprises 200 specimens, was donated to the museum in 1879 by Pietro Rocchi, with the title Collection of Marbles and Alabasters from Rome and surrounding area, as inscribed on the original plaque, below. This nineteenth century collection was formed in a period characterised by widespread interest in Rome for the collection of ancient ornamental stones (marbles as commodities). The specimens lacked any information to identify them, but they represent a significant portion of the many different types of marble whose extraction, commercialisation and use increased significantly in the first two centuries of the Roman Empire, in particular at a time when Rome was also the main storage centre of these materials. The stones arrived in Rome from countries belonging to the Empire situated around the Mediterranean basin. With the crucial support of Professor Lorenzo Lazzarini of Venice University Institute of Architecture, who is among the most renowned experts in the field, each stone has been carefully identified and attributed to a place of extraction. The denomination given to each specimen is the one it has commonly been given in the complex history of these stones: the Latin name has been provided where known. Thirteen specimens that were not identifiable using the nomenclature of ancient marbles have been identified by petrographical analysis. In the light of all these data, we have changed the original title of the collection to Collection of Ancient Marbles, a name which is more appropriate considering its real archaeometric significance. Another 30 specimens have been added to complete the collection. These new additions are easily recognisable as they differ in size from the original ones, which are the same size as those of the more famous nineteenth century collection of Faustino Corsi. The collection currently comprises 230 specimens.